With the growing uncertainty surrounding Brexit and world trade deals, coupled with other problems facing the logistics industry including increasing pressures to deliver more rapidly and a shortage of drivers, it’s no surprise that manufacturing companies are becoming increasingly cautious about taking risks in the supply chain. Trends now show suppliers are increasingly sourcing their goods from countries that are not perceived as high-risk. This is most prevalent in the manufacturing sector but is also being witnessed in the wholesale, retail, and financial sectors. Sourcing from high-risk countries has traditionally been highest in the manufacturing sector, yet more recent data shows a significant reduction in this trend. This could mean that manufacturing companies are more cautious about offshoring to low-cost markets, which are characterised by higher risk. It’s important for the manufacturing industry to understand the types of risk posed within the supply chain. There are two key types: internal and external. Internal risks are completely within your control whereas external may be outside of your control. As a result, internal issues don’t tend to force a company to be more risk cautious with its chain, whereas external risks do. Demand risks – these can be affected by a product’s unpredictability or other geopolitical impacts such as changing governments or trade deals. Supply risks – these include interruptions to the supply chain, often at the source of raw materials. This could be the case for natural disasters or bankruptcy. Environmental risks – these are outside of the supply chain itself but have a negative impact on it. Disasters can again play a part but so can changes in rules and regulations. Business risks – these can be caused by factors that affect the financial management of the company, exchange rate fluctuations or sale of companies. Physical plant risks – this is a risk of the companies’ actual building and can also be affected by changes in rules and regulations that cause disruption. These risks affect the global market and interest rates and therefore can affect how cautious a business is when taking risks in its supply chain. So why is this happening? Many raw materials sourced by the manufacturing sector are underwritten by banks or other financial institutions. Any issues surrounding the sustainability or fairness of this sourcing of materials can impact whether the company will be able to secure vital funding going forward. This has led to growing uncertainty and many manufacturing companies avoiding taking risks in their supply chain in countries that may not be adhering to fair trade or sustainable practices. Another theory may lie in the fact that supply chains are becoming increasingly longer, complex and generally more fragmented, which symbiotically increases the risk exposure for the companies using that chain. As well as uncontrollable variables such as natural disasters around the world and geopolitical events such as Brexit that send aftershocks through industries across the globe. 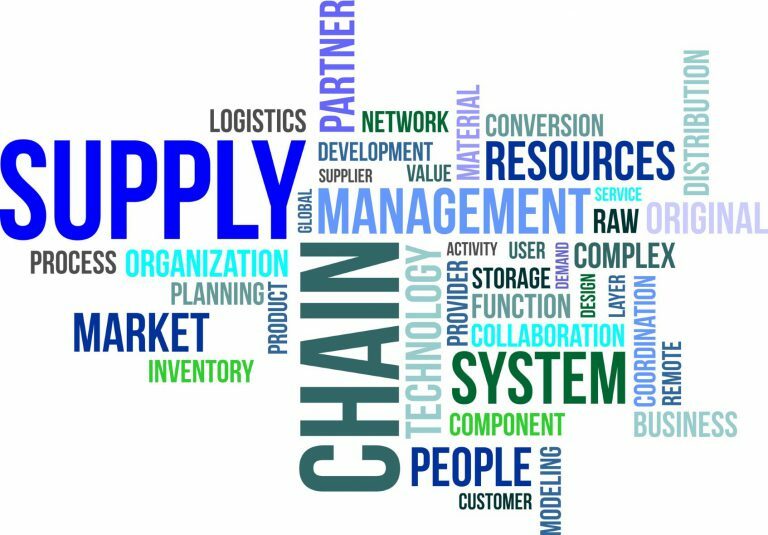 There are also other global events that can have an effect on supply chain management such as fluctuations in exchange rates, changes to rules and regulations, and even bankruptcy of components of the supply chain. There is a multitude of factors that can all have a negative impact on the supply chain and with risks increasing, manufacturing companies are doing what they can to minimise risk. Procurement teams analyse the data, trends, and statistics from reports such as the global supply chain risk report and effectively manage the risk of their own supply chains and protect their businesses to some degree. By collating this data together, manufacturing companies can identify possible trouble spots and minimise any negative impact on their own supply chain. Cybersecurity is an increasingly concerning risk factor for a supply chain in the manufacturing industry. Cyber-attacks in general have become more prevalent in our computer-reliant world and distribution outlets are no exception. By ignoring cyber issues, companies leave themselves open to a host of issues that can compromise their businesses integrity. In fact, it is predicted that cybercrime will cost the global economy in excess of six trillion dollars by 2021. Because of this, manufacturers are limiting who they are willing to do business with. This includes taking fewer risks on countries that are seen as high-risk for compromise and companies which have not adopted cyber-safety in their processes. Hence, both are equally at risk of being cut out of supply chains to minimise risk. Connectivity is playing a leading role in whether companies take risks in their supply chain. In a world of 24/7 global trade, manufacturing companies need to be able to keep in touch with the different components along their supply chain. Despite the ability for systems to be integrated using open-source software, the need to be able to constantly update and upgrade the software also puts it at risk. Each modification results in an increased cost, while poorly integrated systems lead to bottlenecks of data and supply issues. One way around this may be to invest in newer, safer technology such as blockchain, which is secure and accessible to all on the supply chain. In a world of such global instability and changing regulations, it is no wonder that companies are resorting to becoming more risk-cautious about who they include in their supply chains. Manufacturers are leading this trend as they have more direct access to the factors that cause the greatest risk. As such, it is likely that we will see companies looking to source their materials ethically and to switch over to coded, smart contracts, similar to blockchain, that will help to protect and streamline the supply chain from the source. This entry was posted on Tuesday, September 18th, 2018 at 7:36 pm	and is filed under Courier Services. You can follow any responses to this entry through the RSS 2.0 feed. You can leave a response, or trackback from your own site.